In creating a work, Hernmarck plots the amount of weaving she needs to complete each day on graph paper. She told CT Post in October that when first learning to weave, she knew she wanted to create large-scale works. 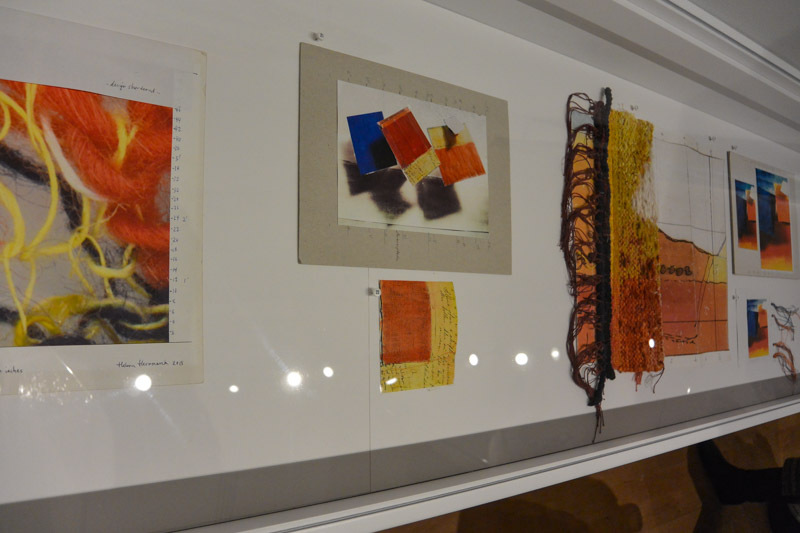 “I decided that if I could weave one square meter a week, I could live on it. And it’s almost true. I made it coarser [using multiple strands] so I could go faster,” she told the newspaper. That bundling has set Hernmarck’s work apart. “Depending on how she twists the strands and what colors and thicknesses she chooses, she is said to be able to give her tapestries unprecedented depth and complexity. 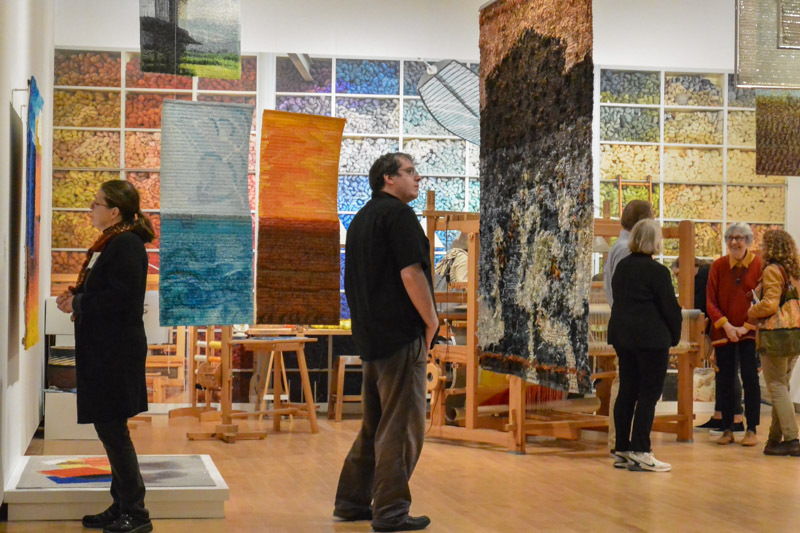 One critical essay described them as almost pointillist,” wrote Joel Lang, “Ridgefield weaver Helena Hernmarck and her loom preside over Aldrich exhibit,” CT Post, October 18, 2018. 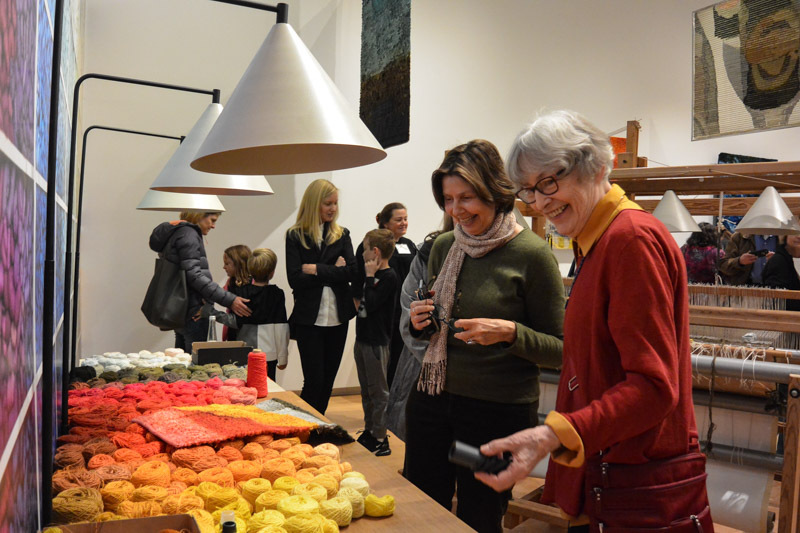 Exhibition view from Helena Hernmarck: Weaving in Progress, at the Aldrich Museum, Ridgefield, CT. Photo by Tom Grotta, courtesy browngrotta arts. Working at the Museum three to four days in a row has required a slight change in approach, Hernmarck says. “It is fun that so many are coming,” including textile enthusiasts and art classes, but hard to get the weaving done as planned while answering all the questions. Don’t miss the opportunity to see Hernmarck’s art creation in action. The Aldrich is at 258 Main Street, Ridgefield, CT 06877, Tel 203.438.4519; general@aldrichart.org. I like your site, it has interesting articles, Thank you.